* * * NOTES: The Prophecy (Christopher Daniels and Donovan Morgan) defeated Bryan Danielson and Michael Modest in a tournament final to become the first ROH tag team champions. * * * NOTES: A.J. Styles and Amazing Red defeated Christopher Daniels and Xavier, who was filling in for Donovan Morgan. * * * NOTES: A.J. Styles and Amazing Red vacated the championship due to Red suffering an injury. * * * NOTES: Th Backseat Boyz (Johnny Kashmere and Trent Acid) won the titles in a Gauntlet match that also involved the Briscoe Brothers (Jay and Mark Briscoe), Special K (Hydro and Deranged), the Ring Crew Express (Dunn and Marcos), and Special K (Izzy and Dixie). * * * NOTES: The championship was vacated when Maff left ROH. The company covered Maff's departure by saying he was forced to retire as the result of an automobile accident, which never actually occurred. * * * NOTES: Whitmer and Jacobs defeated Jay Lethal and Samoa Joe to win the vacant championship. 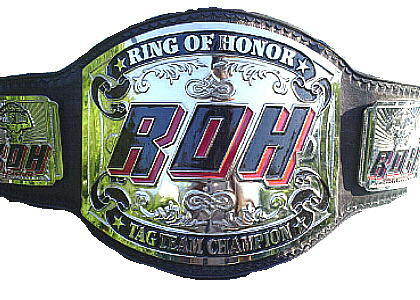 * * * NOTES: The championship was renamed the 'ROH world tag team championship' on July 9, 2006 after Aries and Strong defeated Naruki Doi and Masato Yoshino in Japan. * * * NOTES: Austin Aries was a substitute for Mark Briscoe, who had sustained a legitimate injury during the first and only championship defense. * * * NOTES: The championship was vacated by Jay and Mark Briscoe due to Mark's injury. * * * NOTES: Jacobs and Black defeated Kevin Steen and El Generico in the finals of a one-night tournament for the vacant championships. * * * NOTES: The American Wolves (Richards and Edwards) won the titles in a "tables are legal" match. This episode aired on tape delay May 30, 2009. Claudio Castagnoli 04/03/10 Charlotte, NC The Big Bang! * * * NOTES: After their first defense ended in disqualification, all matches in this reign allowed the title to change hands via disqualification. * * * NOTES: The titles were declared vacant after ROH severed its ties with Kenny King due to a contract dispute. * * * NOTES: S.C.U.M. (Jimmy Jacobs and Steve Corino) defeated Charlie Haas and Rhett Titus in a tournament final to become the vacant ROH tag team championships. * * * NOTES: This was a three-way tag team match also involving Caprice Coleman and Cedric Alexander. * * * NOTES: This episode aired on tape delay August 10, 2013.